American History is filled with the facts of our country and American literature is jam packed with the fiction. But what of American folklore, that quirky little mix that blurs the edges of history and literature, fiction and non-fiction, fact and fantasy- where does it belong? Perhaps in a series of lessons that can be taught either in the English classroom or the History classroom, but that are best taught as a team approach, interspersing the history with the story and providing students with a rich tapestry of Americana that they will appreciate for a lifetime. Let’s start our journey into American folklore with an iconic figure from Ohio, who is credited with spreading apple orchards all across the western territories. 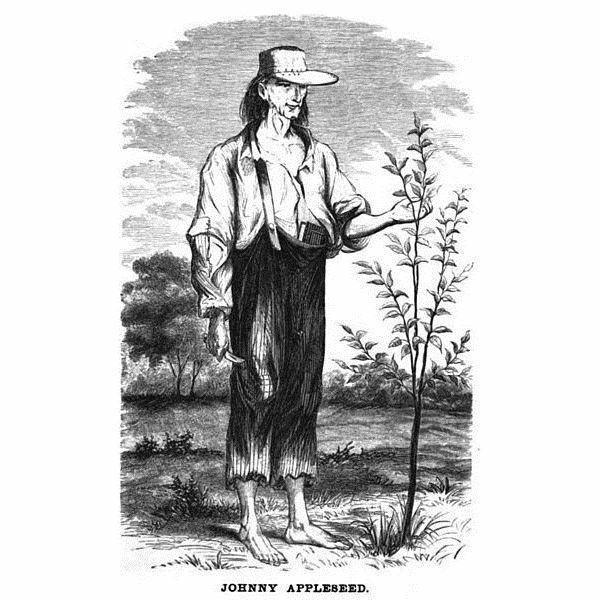 Johnny Appleseed is that perfect combination of man and myth: a real American figure whose actions have been expanded upon to create a fantasy like character for future generations. Search the internet and you will find countless legends about Johnny Appleseed that your students can read and compare and contrast. But first, use the downloadable power point to teach the basics of the actual man and his legend and then, let your students’ imaginations come to life. Move on to the legend of Tennessee, where we meet another real live American who status has become iconic in legend and lore. Casey Jones, that immortalized engineer who always brought the train in on time, has become the stuff hero myths are made of. Once again, use the downloadable power point to teach about his life and then, send your students on a search for Casey Jones’ legends. There is even a Disney cartoon! His actions will be remembered by students for years to come.